Diwali | Where Is Annie? We’re staying at an orphanage in northern India. For me the word orphanage always brings up images of dirty, unkept, unloved, and malnourished children. A place where children are begging for attention and scraps with caretakers who only give them chores. The place where Oliver or Annie lived. Sri Ram Ashram is not such a place. Sri Ram was started by Baba Hari Das, a guru of Ashtanga yoga, who currently lives near Santa Cruz. As a child he had a friend who was an orphan. The director of the orphanage was cruel and beat the children. Baba Hari Das made it his goal to build an orphanage that would be a safe haven and home for the children. He achieved his goal in his 50’s when the Sri Ram opened in 1984. It’s an incredible place built in the countryside outside of the town of Haridwar. Haridwar is a holy city on the Ganges, where the river comes down from the mountains and enters the planes. The countryside is lush. There’s a lot of space for the kids on the ashram’s grounds. They have a playground with swings and a merry-go-round. There’s a big kid pool and a baby pool. The kids get three good meals a day in their dining hall. Milk comes from cows kept on the land. 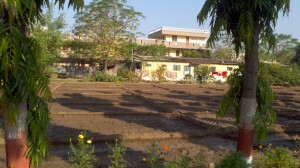 There is a farm for growing vegetables for the kids. The boys and girls have separate dorms. Most children share rooms with two to four in a room. The little ones have “mommies” who live with them at the orphanage. As they get older they move into the rooms with the bigger kids. Many have graduated from the orphanage, some married and some at university. The kids and the staff are family. During holidays they come home, home to the ashram. There is also a clinic here for the kids with a full time nurse on campus. When one of the kids is ill they know they can find Andrea to help them fell better. Andrea knows when they need serious medical care and a doctor. Most of the time they don’t. Sometimes it’s a bandaid, sometimes some Tylenol, but most of the time it’s a kiss that they need. It is strict here. The kids are woken up at 5:30 and get up for morning exercises and prayer service, or arati in Hindi. After breakfast they go to school across the “street” (a one lane dirt path). The school was built by the ashram so the kids at Sri Ram would have a place to learn, but it teaches kids from the village and outlying areas as well. 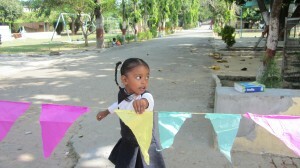 After school they have a bit of playtime, then study hall, arati, and lastly dinner before heading upstairs for bed. They are required to wash their own dishes and clothes and keep their rooms clean once they move in with the older kids. The expectations of the kids are high. They often complain that they have more responsibilities at school because the teachers expect more of the kids from the ashram than of the kids from the village. They really do work hard. Except for the week of Diwali. That’s when we arrived here. It was like Christmas. Combined with Fourth of July. They are out of school for the week, and kids came home for college for their vacation. The holiday did start with work, however; on Sunday the kids were required to clean their rooms and play spaces. Monday was more playful as the kids made greeting cards and treats. In the evening we were all taken by school bus into town for shopping. The market is energized as this is a destination for many Indians during the holidays. Colorful streamers wave overhead glowing from strings of lights, and the people elbow each other through the narrow streets holding the bags of newly purchased wares. A benefactor of the orphanage starts the evening every year at her house which is along the market. We were fed delicious aloo tikka, potato fritters, with tamarind and mint chutneys. 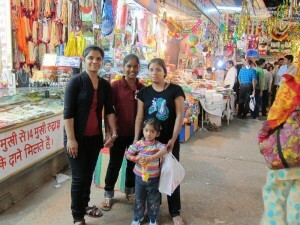 The kids were then given money and sent out into the market to shop. Some got toys, some got treats, and some even got religious icons. It was a time to satisfy the material urges for the kids who don’t have a lot of possessions. Tuesday ‘s big activity was building mud huts. These represented the homes that villagers lived in while their king, Rama, was living in exile. The kids used brick and mud to build wonderful structures that they then decorated with pictures, flowers, colored dust, strings of lights, and beautiful, small oil lamps known as diyas. The lamps were lit in the evening to welcome Rama home. But not until after the kids had all showered. The mud had been used not just to build the huts but also to decorate the kids, their faces, clothes and hair. 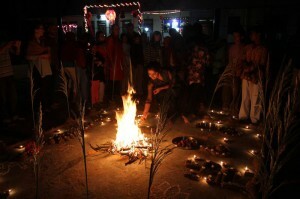 After viewing and blessing the huts, our appetite for fire was then whetted with a few loud and streaming colorful fireworks. Just tempting us for what was to come next. The next day was the major and most holy of the holidays. 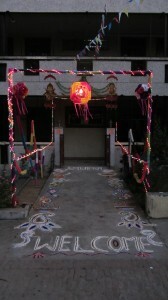 It started by decorating the ashram. Strings were strung across the courtyard. Flour was mixed with water which was used to glue tissue paper flags to the string. With over 60 kids working the banners were constructed in short order and raised overhead crossing the courtyard with waving colors. It was delightful to see made what we in the States would only consider buying at the party store. 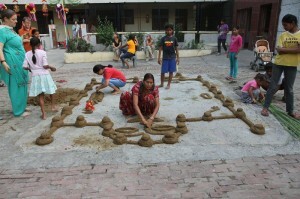 The walkway was also decorated with an alpana, a design of greetings and drawings traced with sand and colored sparkles. Diyas again lined every surface of the courtyard and the surrounding buildings. When the lamps were lit that night, the place became magical. This evening’s arati was longer than usual with additional rituals and songs. Everyone received a red dot or bindi painted onto their forehead by one of the boys. Another of the boys tied a red string around our wrists. For most it was placed on the right wrist. For married women it went on the left wrist. And then there was dinner. It was one of the best meals of our trip. We sat all together, kids, staff, visitors, on the floor with our plates at the ready. We were served each dish separately by some of the kids. There was cholle (garbanzo beans), raita (yogurt sauce), aloo gobi (potatoes and cauliflower), papadams (crisped, thin, spicy chips), and puri (fried, yeasted bread). Like at every Christmas dinner I’ve ever attended, I overate. I couldn’t help it. The kids kept coming around offering me more food. And why would I stop when it was so tasty? I stopped only because I got tired sitting cross legged on the floor. The kids from the ashram weren’t as interested in dinner that night. They knew what was coming next, and they wanted to get on with it. They were ready for the fireworks, or crackers as they’re called in India. Each child was first given a bag full of personal fire making toys. The older the child, the better the stuff. 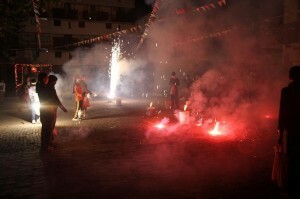 Of course, there were sparklers and poppers. 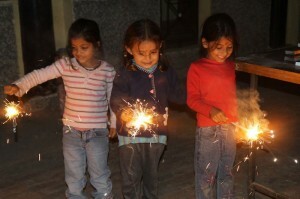 The cutest sight of the night were the three to four year olds standing stock still watching their sparklers burn down only the be given a new one to watch, just like chain smokers. 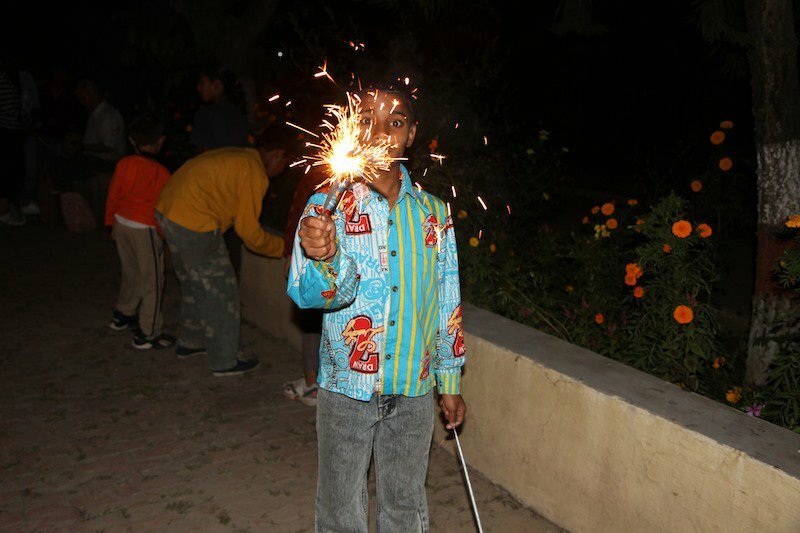 For the older kids there were also screaming sparklers which sang a high pitched note as sparks shot out of the stick and spinners and cones which shot out sparks and balls of colored fire shooting up and out in random directions. And there were the real fireworks. 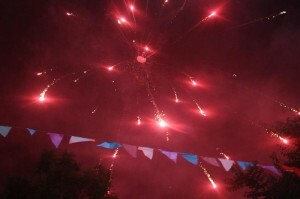 The three inch mortars shot out loud booms followed by explosions of light and color spreading out in three dimensions. Just like the fireworks during our visit to Italy. But even bigger, and this show wouldn’t stop. There were more and more, until finally anything left was shot off at once with extra bangs and extra fire. It’s hard to convey the feeling of fear, excitement and utter exhaustion from a never ending display of fireworks. Especially during a homespun display. This wasn’t a professional display. They don’t do that here. This is India, after all. And still no one got burned. The next day, Govaradhana, started slowly. The kids were allowed to sleep in after their night of noise and light. 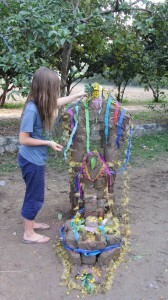 In the afternoon a pile of cow dung was delivered to the courtyard, and the girls and women started building with it. A mandala was drawn with the dung. Small, round rises were constructed every foot or so. A face was drawn toward one end, an entrance was made toward the other. The word “om” was enscribed; effigies of cows eating grass were placed on one side of the mandala. Tall, stout grass fronds were placed in the rises. The diyas were placed along the edge. 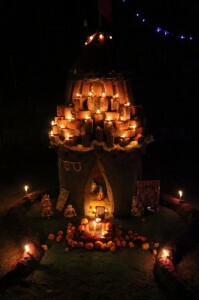 After dark the diyas were lit and a fire was built in the center of the mandala. We walked around the mandala as a fire burned inside. Individually, we entered the temple and added powder to the fire. Then we went to visit the cows. We went to offer them a gift. We handed them sweet pakoras which they grabbed in delight with their rough, slimy tongues. After that it was our turn to eat the pakoras. But first we washed our hands. 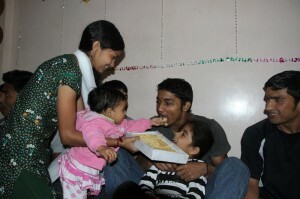 The last day of festivities was Bhaiya Dhuj. 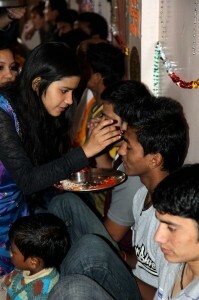 It is one of the Indian holidays in which girls treat their brothers. At the morning prayer the boys sat along the wall. 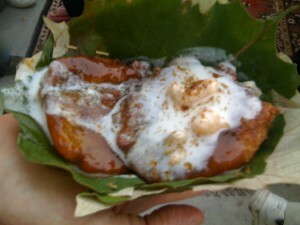 After the prayers all of the girls lined up to place a bindi on the boys’ foreheads and feed them sweets. In a more classic family, a boy may have to receive sweets from three or four sisters. In this family there are about 40 sisters shoving candy and coconut in his mouth. It started with the littlest sisters; some of them put their whole hand in a brother’s mouth along with the candy before moving onto the next boy. It was cute to watch. The boys only felt sick by the end. Many of them skipped breakfast. Hank never knew he had so many sisters to feed him so much candy. Still he was very lucky to start his trip to India with the week of Diwali. Our whole family was lucky. What a holiday full of fireworks, cow dung, mud, and shopping, a delicious dinner and a son stuffed with sweets. 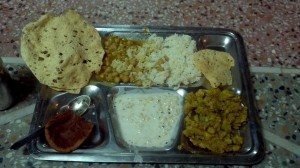 It was full of the flavors of India given to us by an orphanage. Thank you, Sri Ram! Wow…what an experience! I am soooo jealous, wish I could have been there…It transported me, to my experience of Diwali growing up in South Africa. Somewhat different but essentially the same! p.s. missing you at john muir!!! Such a good description of your experience! I was there (in my mind)!